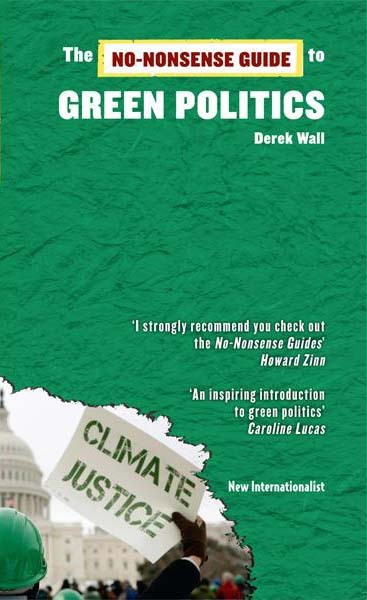 Although the party has been in existence for three decades, any book that comes out now about the Greens, at least in the US, is still going to be an introduction, and ‘The No-Nonsense Guide to Green Politics’ by Derek Wall is no exception. In this year of protests against the union-busting agenda of several governors — Democrats like Andrew Cuomo in New York as well as Republicans like Wisconsin’s Scott Walker — and a nuclear catastrophe unfolding in Japan while the Obama White House continues to defend nuclear power, Mr. Wall’s case for the Green Party’s importance as an independent political alternative is especially timely. More detailed analyses of the Green political movement, covering the progress of Die Gruenen (German Greens) or the tangled history of the Green Party in the US would be valuable, and I’d like to see a book some day on the Ralph Nader’s 2000 Green presidential campaign with a few good chapters critiquing the ‘spoiler’ accusation that Democratic Party apologists have hurled at Green candidates since Election Day 2000. It’s still easier to blame Mr. Nader and the Green Party than to account for the virtual acquiescence by Democrats to widespread GOP election irregularities in Florida and perhaps other states, a patently biased Supreme Court ruling, and Al Gore’s feeble campaign. Nor is it easy to understand why so many progressive Democrats remain loyal to a party that has abandoned them, most exasperatingly so during the two years since Barack Obama took his oath of office and the Dems controlled both the White House and Congress. ‘Green Politics’ begins with a thumbnail description of the emergence of Green Parties throughout the world, but moves away from electoral politics by the second chapter to a discussion of the seriousness of global warming’s threat to the planet. Mr. Wall doesn’t say so explicitly in this chapter, but it’s implied that the Green Party will become more and more indispensible as climate change catastrophes loom in the coming decades. Leading parties, especially those with corporate ties like the Republicans and Democrats in the US, have either denied global warming or espoused solutions that are meant first to maintain business profits, such as carbon emissions trading (‘cap and trade’), which allows polluters to trade licenses to pollute. Mr. Wall writes, “Putting our trust in carbon trading is like coping with the threat of lung cancer by lighting up another cigaretter and hoping you can encourage someone else to give up if you give them a cash incentive controlled by a hedge fund.” Climate change is and will remain a political crisis, in the same way that the destruction caused by Hurricane Katrina and the Japan tsunami are political, because its effects will be aggravated by the negligence of government bureaucrats, politicians willing to serve corporate lobbies and campaign contributors, and political ideologues who believe that government services should be rendered too minimal to deal with disasters. Overall, the chapter on global warming is an excellent reference for Green activists, especially the discussion of Cuba’s green revolution after the fall of the Soviet Union ended the small island nation’s oil shipments. The ‘Green Philosophy’ chapter describes various movements under the greater Green umbrella. I was already familiar with some of these camps, but seeing them rehearsed in Mr. Wall’s summary made me think of the “elevation of small differences.” I’m sure the distinctions between ecosocialists, ecoanarchists, ecofeminists, Green localists, et al. are important to themselves, but how vital are they in the context of, for example, introducing concrete measures to reduce car traffic, replace factory farming by agriconglomerates with locally based Permaculture farming, or end the War on Drugs? Do these different movements affect Green electoral organizing, or are they too arcane for 99 percent of citizens about to enter the voting booth? We should see many of these differences as a false choice. The Green Party, at its best, rejects cookie-cutter formulas and admits diverse and equally Green ways to solve problems. The party can embrace Green socialism, Green localism, Green markets, and other ideas, applying them wherever they’re most effective. For example, Social Security, under attack now by both Democratic and Republican leaders but supported by Greens, works better as national program than it could locally, since pooling at the national level serves old people in poor communities who would suffer if Social Security were municipally based. The Green Party’s support for socializing health coverage by expanding Medicare to include everyone is based on the same principle. Coverage based on corporate profits is self-defeating, since health insurance companies increase their profits by denying and restricting medical care. (Health care professionals would remain competitive, however, since Medicare For All would allow us full choice of physician and hospital.) We can justify nationalizing the fossil-fuel energy industry, since profit-making companies like Exxon Mobil are among the greatest obstacles to reducing fossil-fuel dependence in this century of global warming and peak oil. On the other hand, we know that entrenched bureaucracies are vulnerable to corruption, inertia, and disregard for human and environmental needs, as the Soviet system proved. Should a Green government have the power to decree that every family farm or restaurant be transformed into a collective? Do we want civil authorities to meddle in the newspaper business or the Internet? If a Green ideology exists, it’s based on humane and ecological principles rather than single-model prescriptions for economics, government, and other spheres of human behavior. The classic ideologies of the 19th and 20th century — laissez-faire capitalism, bureaucratic collectivism, fascism, and various theocratic fundamentalisms — all value abstractions, systems, and doctrines over human life. Stalin made communism work by allowing millions of Ukrainian peasants to starve to death; fascists liquidated ‘useless eaters’ and scapegoat minorities; business owners resisted the right of workers to livable wages, reasonable hours, and safe workplaces; corporate polluters dumped lethal substances regardless of the effect on nearby residents; religious zealots condemned queers and unsubmissive women in the name of a savior, prophet, or edity. Derek Wall recognizes that deep ecology, taken to an extreme as a single-model ideology, reduces humans to ecological cogs. He mentions deep ecologist Dave Foreman’s claim that AIDS and famines in Africa should be welcomed because they reduce human populations and thus mitigate the environmental harm that people cause. Mr. Wall gives a few paragraphs to ecofascism, dismissing it as he does Dave Foreman’s ghastly statement. But it’s possible that ‘green’ movements founded on dangerous and regressive ideas will draw some amount of popular support in the coming decades, if the effects of global warming cause major disruptions in parts of the world, destroying access to food, water, and other necessities. In times of crisis, people are often drawn to leaders who offer simplistic answers, prey on prejudices, and blame easy scapegoats. The rapid rise of Hitler and the Nazis during Germany’s economic meltdown in the late 1920s and early 30s is the classic example, as are the fundamentalist religious movements that gained force around the world in reaction to the depredations of European and US colonialism. The Tea Party, gaining popularity in the wake of the recent subprime mortgage crisis and multi-billion-dollar taxpayer bailouts for Wall Street financiers, is another. In this context, the Green emphasis on democracy, social justice, and nonviolence makes the party even more urgent. In my experience, every Green who runs for office has an interesting story about what it means to campaign as a Green. Unfortunately, Derek Wall spends little time on the practical day-to-day business of political organizing, election campaigns, winning ballot access; the severe obstacles Greens often face in trying to accomplish these things; or the unique ways Greens carry out their responsibilities when elected to public office. The book sometimes jumps back and forth between Green Party politics and lower-case green movements. There’s a substantial gap between the two that Mr. Wall doesn’t acknowledge. Activist movements, even when they espouse holistic principles, tend to be short-lived. They might expend an enormous amount of energy on specific targets and then peter out, as in the case of Earth First! and ACT UP. If they achieve a degree of organization and permanence, they often find themselves coopted into the establishment, for example, the Sierra Club, many labor unions, and other liberal lapdogs of the Democratic Party, which in turn takes their support for granted. In contrast to activist movements, the Green Party as an electoral organization is trying to establish itself as a permanent opposition to the ruling parties, a goal with a unique set of challenges. In the US, the Green Party faces unfair ballot access rules enacted by Democratic and Republican officials to preserve their own advantage, elections in which the candidates of the two establishment parties (‘Titanic Parties’, as 2010 California Green gubernatorial candidate Laura Wells calls them) enjoy generations campaign checks from corporations, and a voting public that often hardly knows that the Green Party exists. Mr. Wall discusses the split between the German Green ‘realos’ (political pragmatists) and ‘fundis’ but misses an angle to the story with even greater consequences for Green Parties in countries where they’ve achieved some success: Joschka Fischer’s appointment to Minister of the Environment and, later, Foreign Minister as a result of the coalitions between the Greens and the more powerful Social Democratic Party. What does it mean when Greens win power through appointment rather than popular election? In Mr. Fischer’s case, he was either willing or compelled by his employers in the Schroeder government to support German military action in Serbia and the US/NATO invasion of Afghanistan, to the dismay of Greens throughout the world. These are minor criticisms for a book about the transformative promise of Green politics. I was a bit more disturbed by the rather general descriptions of the US Green Party’s politics and the erroneous claim that the highest office in the US achieved by Greens is Mayor. In fact, Greens have served on county commissions and in state legislatures. The description of the US Green position on Israel and Palestine is vague and omits mention of the endorsement of boycott, divestment, and sanctions directed at Israel. Did Mr. Wall check any of the party’s numerous public statements on the conflict? A gap that will be obvious to many American Greens is the lack of any mention of Green involvement in racial politics: mass incarceration of black and brown young men as a result of the War on Drugs and the private prison industry (which profits by filling up cells), wide disparities in economics (black homeowners were especially vulnerable to subprime mortgage lenders) and life expectancy between blacks and whites, the movement to win statehood for the District of Columbia, the response to the Katrina disaster (disproportionately displacing black residents of New Orleans and other areas), and reparations for the descendents of slaves. Green positions and actions on these issues show some of the sharpest differences between Greens and the Titanics. I discovered a clue that suggests Derek Wall might have used the wrong source of information. In the ‘Politics for Life’ chapter, which summarizes Green platforms and posiitions, his link to the Green Party platform (http://www.greenparty.org/platform) leads us to the platform of the wrong Green organization, Greens/Green Party USA (GPUSA). The party that is recognized by the Federal Election Commission and ran Ralph Nader, David Cobb, and Cynthia McKinney for President, as well as hundreds of local candidates in every election cycle, is the Green Party of the United States (platform: http://www.gp.org/platform.shtml). A comparison of the home pages of GPUSA (http://www.greenparty.org) and the Green Party of the United States (http://www.gp.org) reveals where the action is. The error should be corrected in future edtions of the book. Overall, however, ‘Green Politics’ is a valuable, concise, and inexpensive introduction to the Green Party, green movements, and Green politics in general. Will it win more support, memberships, registration, and votes for Greens? Can Greens get the book placed in libraries throughout the US? Scott McLarty has served as media coordinator for the Green Party of the United States and for the DC Statehood Green Party. His articles, guest columns, and book reviews have been published in Roll Call, CommonDreams.org, Z Magazine, Green Horizon, The Progressive Review, In These Times, and several local and community publications and small press. He joined the Green Party in 1996, and in 1998 ran for the Ward 1 seat on the Washington, DC City Council. Mr. McLarty grew up in Long Island, New York, and now lives in Washington, DC. 1 Comment on "The Global Green Imperative"